RICHMOND — The Highlanders paid a visit to Lulu Island and squared off against a host Wildcats program making its move up to the Triple A tier this season. Poor February weather curtailed many training sessions for both sides, and both teams were missing key performers. Ben Welsh, Harry Waddell and Steve Choi each counted a pair of tries for the winners while Amirali Azim was able to facilitate so much of the offence. “He was setting up tries, showing great speed and, as well, so much commitment in defence,” noted Highlanders head coach Paul Welsh afterwards of the team’s Man of the Match. NORTH VANCOUVER — Traditional Klahanie Park was the setting for the first-ever senior varsity boys game in Byrne Creek history. 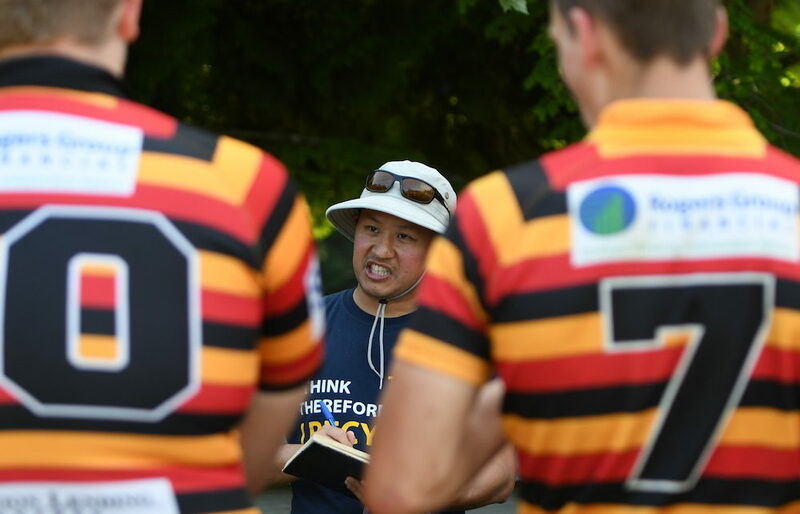 The Burnaby side gave a tremendous account of itself in its debut against the defending B.C. Double A provincial champions. Francesco Tosato was the Bulldogs’ Man of the Match, scoring a pair of tries in the loss. Muhammed Atasoy also scored for Byrne Creek while Jeevan Sahota added a pair of conversions and Abed Alissa another. VANCOUVER — The Kitsilano Blue Demons came out strong from the first whistle, putting up a wall on defence and doing more than suggest they will be a strong attacking side this season. Showcasing his powerful running lines and kicking skills, Leandré Plouvier scored three tries for the winners and also booted five conversions. With the basketball campaign now over, Sten Petersen laced up his boots and scored a pair of tries. Zach Oldham also scored a pair of tries while Sammy Batson, Sol McMillan and Lewis Seitz added one try each. VANCOUVER — Camosun Park was the setting for the visiting Royals’ hard-fought win over the Grey Ghosts. Four different Handsworth players found touch, including star UBC Thunderbirds’ football recruit Keelan White, who impressed with a scoring run down the blindside off a wide ball movement. Darren Colpitts scored off a good team movement across the field, taking a nice inside ball from Steele Marshall. Joseph Church also scored off a powerful five-metre maul, while Grade 11 Robert Lutman added a try off an open-play burst down the wing. The game was deadlocked 10-10 in the late stages before a pair of tries by the Royals broke things open. VANCOUVER — Game details unavailable. NOTE — Coaches or team managers can send game reports immediately following matches to howardtsumura@gmail.com. We’d love to hear about your spring tours as well!